• 1 whole brisket, 10–12 lbs. Advice from Pitmaster Michael “Grumpy” Grimm: Before starting, make a mop to tenderize and flavor your meat. Everyone has his or her own likes. The only advice here is to not use tomato or sugary ingredients, as they may burn and cause a foul flavor. You need an acid base, either cider vinegar or beer, to equal parts water or fruit juice. Add garlic, onion, kosher salt, black pepper, and a spice such as cayenne or pepper flakes, or hot sauce. It’s all in the sauces and rubs that appeal to your tastes! While preheating, trim excess fat to about 3/8-inch. Use your favorite brisket rub and apply coating liberally on all sides. Place brisket in center of smoker and cook for 12 hours, mopping periodically. When the internal temperature of the meat reaches 195°F, remove and let cool until comfortable to handle. Separate the flat portion of the brisket from the point with a sharp knife. Trim obvious excess fat. Reserve the flat for slicing and serving as sandwiches on some nice rolls. Re-rub the point with the dry spice mix and smoke for an additional 2 to 4 hours, until the internal temperature is 205°F. 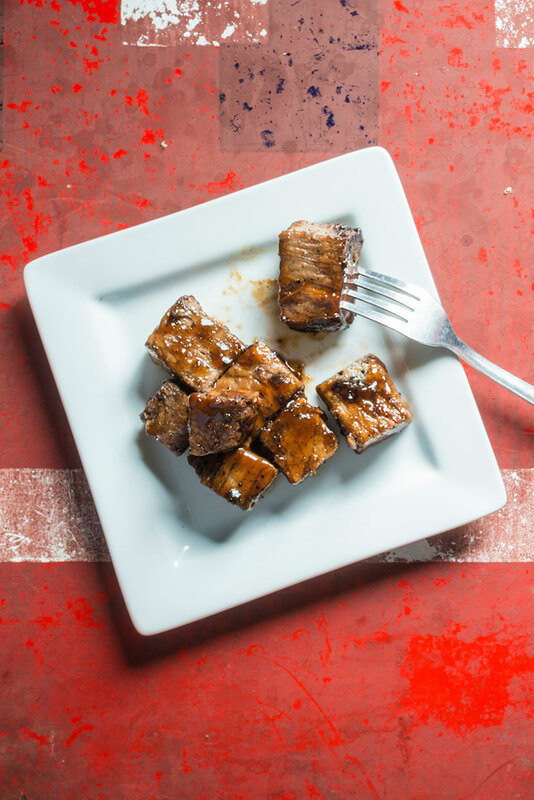 To serve the burnt ends, trim excess fat and cut into small chunks against the grain. Offer your favorite barbecue sauce on the side. A whole brisket, also known as a packer brisket, consists of the meatier, straight-edged “flat” portion (which is also used for corned beef or pastrami) and the fattier, curved “point” section (which is considered a delicacy when served as burnt ends). Because of the higher fat content, the point requires a longer cooking time to achieve tender, delectably charred succulence. While great on their own, burnt ends can give a smoky kick to baked beans, chili, gumbo and more.